The Association of International Research and Development Centers for Agriculture (AIRCA) is a stakeholder in the Global Forum on Agricultural Research. On the occasion of World Soil Day, AIRCA has posted a story “Healthy soil: the foundation for healthy people and landscapes”. 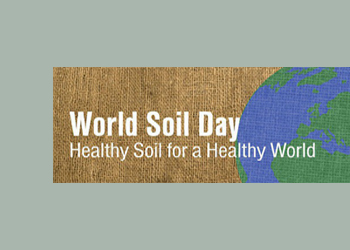 On 5 December – World Soil Day – we celebrate the importance of soil as a foundation for healthy people and landscapes. As global population grows and places demands on agricultural outputs, we need to think carefully about how we use resources, including land. In the context of food security, simply increasing the amount of agricultural land we use is neither desirable nor feasible. What we need is innovation, from the ground up. Sustainable intensification is critical for producing more food using the same, or less, land in a way that minimises negative impacts on resources. Sharing scientific knowledge, local best practice and relevant innovation with smallholder farmers can help achieve this. Integrated Soil Fertility Management (ISFM) is an obvious example. It substantially increases crop health and yield, sometimes two- or threefold, through various means including fertilizers. The goal is to take existing ISFM information and put it in the hands of farmers who can benefit from it in other parts of the world. Partnerships such as the Africa Soil Health Consortium (ASHC) accomplish this objective through training extensionists and scientists, and by using practical materials such as books, cartoons and posters. Small changes, for example altering the way in which fertilizers are introduced to soil, can have a substantial impact. Using micronutrient-enriched fertilizers also helps transmit nutrients from soil to plant, to animals, and to humans, benefitting the health of all. Good water management systems must also be researched and implemented, to help yield ‘more crop per drop’. We can further maximise health benefits by researching new crop varieties that are resilient to drought and submersion, for example. Developing better crops for the future may also mean re-evaluating neglected or underutilised local varieties that can offer potential new sources of improved food, nutritional, culinary and medicinal value for smallholder farmers. This is important because, until recently, food security has been focused on research investment in traditional staple crops – maize, rice, wheat – to tackle hunger. It is now widely accepted that we must go beyond calorie intake and look at the nutritional balance of crops grown and consumed. We need more focus on fruit, legumes and vegetables. Helping people achieve a well-balanced diet will address the ‘hidden hunger’ of malnutrition. For many rural communities, growing and selling relatively high-value horticultural produce offers indirect health benefits, since the income gives farmers the choice to buy nutritionally-valuable produce they cannot grow. We must also look at the way we use land and water resources for animals, fish and poultry, which are valuable sources of protein, fatty acids and essential vitamins. When considering land use, it is important to see the bigger picture, understanding that agricultural production systems interact in many ways and levels of scale, from plot to farm, and from farm to landscape. Challenges arise when trade-offs must be made between different land use objectives, for example, sustainable agriculture and environmental protection. Helping farmers to put research into use when they make decisions on land management will be essential. The members of AIRCA are committed to tackling agriculture and the environment at the landscape level. This approach to sustainable agriculture requires the creation of solutions that take into account the diversity of interactions among people and the environment, agricultural and non-agricultural systems, the crossing of national boundaries, and other factors that represent the entire context of agriculture. Working with women and young people will also be important. As global food demand rises, so too do opportunities for young people’s careers in agriculture. Education and skills training can help create the next generation of eco- and nutrition-savvy farmers. Empowering women in rural communities is also essential, helping them build healthy futures through agriculture. The earth is the foundation upon which we can sustain human health, food security and natural ecosystems. Soil health is an essential component to meeting some of the world’s most important challenges.